Who's your favorite ElfQuest character? 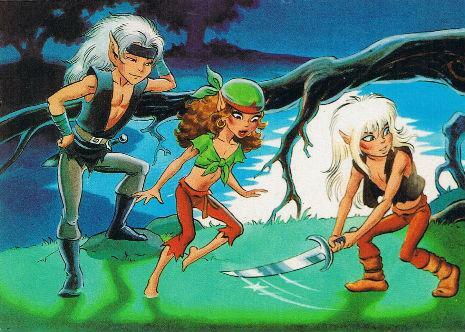 Who is your favorite ElfQuest character and why? I love Skywise because he has a personality similar to my own! He's humorous and loves the stars (like me) I also love Tyleet because she is calm but still strong and fearless! Love Skywise on, Pike, Strongbow and Moonshade, Bearclaw and Joyleaf. Skywise on - love to the stars and love to Love. A Pike for his never-ending optimism. Strongbow is possible for the strength of character, Moonshade - we both love to sew, to create clothes. Bearclaw also in nature, rebellion circumstances. Joyleaf for her wisdom. And the beauty. Skywise is my favorite as well. I was only 8 when I started reading and my favorite color was (and still is) blue, so his clothing choice is what drew me too him. As I got older he remained my favorite as I love his humor, loyalty and general personality. Skywise. I saw him look at the stars in the desert, and he stole a piece of my heart right then. Rainsong. It used to be Skywise many years ago but Rainsong has been my favorite for many years now. I dig Moonshade as well. My favorite is Newstar with Shenshen and Pike trailing behind. I'm also fond of Picknose for being the troll Jackie Gleason. manga said: Rayek for now, always and forever!!! It should also be rather obvious in my case. :| For many reasons. And most character development i.m.o.. I guess I also share some treats with him (but I also share probably a lot with Redlance). But there are some overlaps. Followed by many others: Venka & Clearbrook, my calm girls. Redlance cause he's gentle and nice. Strongbow to a certain extent. Teir for several reasons, relatively calm, a bit mysterious. Treestump is fine, too. Aroree. Tyleet's nice, too. And many others. I barely have dislikes for characters. Though I certainly don't love Djun or Winnie. As my name says.... Eyes High! Although we haven't seen much of her I like to believe she is my kind of girl! Cutter has been my first reason I started reading EQ, closely followed by Skywise! One of the first issues I read is the one Leetah finally accepted the Recognition. Cutter opened his heart to her, showed how he felt.... I was still very young and was in awe over this. This was how a boy had to show his love for me.... instand love for Cutter! That also explains my love for Eyes High, she must have been much like Skywise! So.... I am a stereotype kind of fan.....lol. There aren't all that many pictures where my three favorite characters are together in a row. Here they are as cubs. Cutter, Skywise & Nightfall. At different times each one is my favorite character, depending on how I feel. I suppose if I'm the most like Skywise if I had to pick one, but Cutter was my only favorite for a long time when I was younger (I grew my hair out because of him...now I hate having long hair, how weird), and I've drawn Nightfall so many times her face is imprinted on my eyelids. I love these three so much. Nightfall as my name says. I like her because she is every thing I would like to be. Shenshen because she's freespirited, cute, trying to be recognized as worthy of being Leetah's sister, and eternally optimistic. And more in touch with her emotions which is something I kinda envy. Skywise 'cause the dude's always got his soul-brother's back, is a philosopher, and possibly the only person out of the current few generations to recognize a High One. Which is always wow. Did I mention that he's got that whole wise beyond his years thing going for him? Rayek because he's got that need to prove himself at all times, perfectionistic [dude knows what I feel about that], and a metric ton of development. Aroree because she just wants a place to be after losing Voll and is, like Shenshen, a form of beautiful that I just can't help but want. Helps that she can freaking fly! And I get a total brother instinct of wanting to comfort her or fight off people who'd torment her. Redlance and Nightfall. Favorite couple aside from Cutter and Leetah. Gentle redhead who WILL tear you apart if you mess with him and his family and a hot archer lady who shows that it's ok to be the woman in a 'man' role. Kahvi's just that little bit nuts but tough enough to back it up. She knows what she wants and she will find a way to get it. May be a bit fickle and possibly totally insane but she's still worth a try. Two Edge 'cause he may be totally nuts but he wants to know who he is and prove that he's worthwhile. And he's a damn good smith and 'chessmaster' so that helps. Seriously, he plays the game so freaking well. Kinda admire that, even if he's out of his gourd. Let's not forget Ekuar. He managed to survive TROLLS for centuries, can shape earth and stone, keeps Rayek of all people from going off the deep end and has his respect, and is possibly one of the wisest Elves in the entirety of Abode [sans Savah and Timmain]. Dude has balls of steel for sticking around Rayek when Winnie's possessing him and keeping him from letting her out. If that alone does not make him worthy of respect, I think you're beyond hope. Timmain, Timmain. Wolf-mother, shapeshifter, radiant and eye-catching, eyecatching, quite fetching if you ask me. And in my opinion, mother I'd like to love among mothers I'd like to love. Might think of others and more reasons later but yeah. Just some reasons why I dig some of the characters. As much as Nightfall is my all time favourite, I go through phases of having new favourites the more we see of certain characters and how they develop. I also really like alot of the Wave dancer characters -Snakeskin, Reef, Strand, Skimback etc. Redmane said: Let's not forget Ekuar. Indeed. He and Venka were probably the best things that happened to Rayek yet.